Inline Rolling Diaphragm 2-Way – Plast-O-Matic Valves, Inc.
Series RVDM features a primary rolling diaphragm and a secondary flat diaphragm which incorporates the Plast-O-Matic patented Fail-Dry design for added protection. The rolling diaphragm provides greater sensitivity than non-diaphragm style relief valves, and is ideal for all applications without vacuum on the outlet. 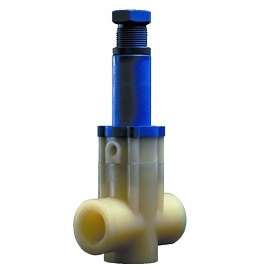 1/2″ – 1″ sizes in most popular thermoplastic materials and connections; 5 – 100 PSI set range (5 – 125 PSI on 1/2″ only).